Below are the best hotels in Huntington Beach, California - there is sure to be something that pleases everyone and all types of budgets. Families searching for resort style amenities onsite and easy beach access should stay at the Hyatt Regency Huntington Beach or the Waterfront Beach Resort, A Hilton Hotel. Younger adults with or without children will enjoy the surf culture atmosphere available at the trendy upscale Kimpton Shorebreak Hotel as well as the Paséa Hotel & Spa. The Ocean Surf Inn and Suites boasts value with a small kitchenette and comfy rooms. If you are searching for more added value options such as a complimentary breakfast the a perfect selection is the Best Western Harbour Inn and Suites, Huntington Beach Inn or the Travelodge Ocean Front. When you are seeking a luxury resort style hotel in Huntington Beach that is ideal for families and boasts quick access to the beach then the Hyatt Regency Huntington Beach is a superb choice. 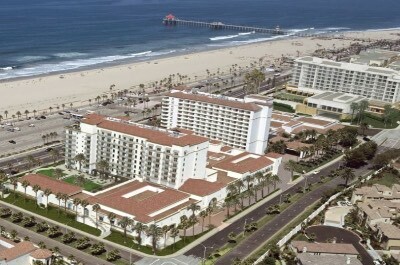 Located 1.5-miles south of downtown Huntington Beach, the Hyatt Regency Huntington Beach is situated across from Huntington Beach State Park and is within 0.8-miles to the Huntington Beach Pier. The Hyatt Regency Huntington Beach has a modern Mediterranean four story architectural design with 517 rooms and suites which sport a contemporary interior. All rooms and suites have a private balcony/patio with courtyard, partial-ocean or full ocean views. Rooms are sized between 436 to 465 square feet with a variety of bedding and views available. Regency Club rooms are sized similar with added amenities like a private lounge with a complimentary breakfast and nightly happy hour. Deluxe rooms are 540 square feet with an open floorplan that contains a sofa sleeper and various views. One-bedroom suites range in size from 900 to 2,500 square feet with a separate living room that has a sofa sleeper and a variety of views are available. The Hyatt Regency hotel in Huntington Beach is just minutes by foot to Huntington Beach State Park where you will find plenty of sand for relaxing and beach games. You can arrange for your favorite watersport adventure onsite and there are complimentary lessons for surfing as well as standup paddleboarding. The resort offers a seasonal shuttle to Disneyland and you are within a short walk to Pacific City for shopping, the International Surfing Museum as well as 4-miles to Bolsa Chica Ecological Reserve. The Hyatt Regency hotel in Huntington Beach boasts a kid’s club, a playground, game room and there is a waterpark with waterslides for children. The resort has a lagoon-style freshwater swimming pool with a great sundeck overlooking the Pacific Ocean, a fitness center, shopping boutiques and a full service spa onsite. Dining at the property includes the Watertable for all three meals; Pete’s Sunset Grille and Tower 15 Pizzeria serve lunch as well as dinner; Mankato’s Grill and Shubee’s Bar and Cafe serve poolside. Nightlife includes a concert series with live music at Pete’s Sunset Grille and live music on the weekends at the Watertable or you can sit by the fire pits and roast smores with the kids. The Waterfront Beach Resort, a Hilton Hotel is a superb hotel in Huntington Beach which is perfect for all types of travelers including families that are seeking a resort style atmosphere and a short walk to the beach. Located in the heart of Huntington Beach, the Waterfront Beach Resort, a Hilton Hotel is situated 1-block from Huntington Beach State Park and is 0.5-miles from the Huntington Beach Pier as well as 30-minutes from Disneyland by car. The Waterfront Beach Resort, a Hilton Hotel has a modern Mediterranean twelve floor architectural style with 285 rooms and suites which boast a contemporary decor. All rooms and suites have a private balcony/patio which offers views of the resort, pier, coastline or Pacific Ocean. Rooms are 350 square feet with a choice of bedding and various views are available. Twin Dolphin Tower double rooms are perfect for families with 500 square feet that contains two queen size beds and there are various views available. Studios in the Twin Dolphin Tower as well as the resort building range in size from 460 to 550 square feet with various floorplans and views available. One-bedroom suites have between 525 to 650 square feet with a variety of bedding options, a separate living room that has a sofa sleeper and most suites offer a pool or ocean view. The one-bedroom Family suite has two queen size beds, a separate living room with two sofa sleepers and ocean views. The Waterfront Beach Resort, a Hilton hotel in Huntington Beach has great access to Central Huntington Beach where you will find beach games and plenty of sand for relaxing as well as a plethora of watersport activities from surfing to kayaking. The Waterfront Beach Resort, a Hilton hotel in Huntington Beach boasts easy access to many of the areas stellar attractions such as the Huntington Beach Art Center, Huntington Beach Central Park and the Reptile Zoo. The property offers several children activities during day as well as a freshwater swimming pool with cabanas and a fitness center. Dining at the Waterfront Beach Resort, a Hilton Hotel includes Shades Restaurant and Bar for all three meals and Surf Hero Market serves quick bites poolside. Offsite dining choices within walking distance are plentiful with the Watertable, Pete’s Sunset Grille and Ruby’s Diner. Nightlife includes live entertainment on the weekends at Shades Bar and you can walk to Tumbleweeds Bar and Grill. 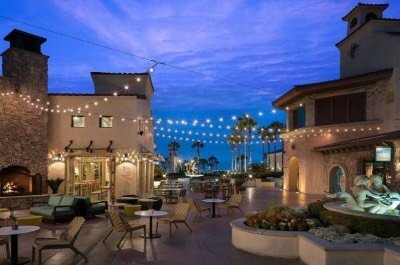 When you are looking for an upscale boutique hotel in Huntington Beach that boasts a trendy laidback atmosphere and is great for younger adults then you should stay at the Kimpton Shorebreak Hotel. Located at the intersection of Main Street and the Pacific Coast Highway in central Huntington Beach, the Kimpton Shorebreak Hotel is just steps away from North Huntington Beach and is 2-blocks from the Huntington Beach Pier. The Kimpton Shorebreak hotel in Huntington Beach has a modern four story architectural design with 157 rooms and suites which sport a chic surfer interior. Deluxe rooms range in size from 310 to 405 square feet with a choice of bedding and views of the surrounding area from floor to ceiling windows. Ocean view rooms have between 308 to 415 square feet with a choice of bedding and private balcony. One-bedroom suites range in size from 435 to 496 square feet with a separate living room that has a sofa sleeper and a private balcony with partial-ocean, ocean front or pier views (Deluxe King Suites do not offer a balcony). The two-bedroom Ocean front suite has 610 square feet with a separate living room that contains a sofa sleeper, 2-bathrooms and a 700 square feet terrace area. The Kimpton Shorebreak Hotel is directly across from North Huntington Beach where you will find plenty of sand for lounging and there is complimentary beach equipment for you to use. You can arrange for your favorite watersport activity through the onsite concierge and you can travel on land with access to free beach cruisers. The Kimpton Shorebreak hotel in Huntington Beach has a great spot for starting your adventures of the area with several attractions within 4-miles that include the Bolsa Chica Ecological Reserve, the Shipley Nature Center as well as Huntington Beach Wetlands and you are within a short walk to downtown Huntington Beach. The Kimpton Shorebreak Hotel has a fitness center and a record library but does not offer a freshwater swimming pool. Dining onsite includes all three meals at the Pacific Hideaway. Offsite dining options within walking distance are numerous with choices such as the Sugar Shack Cafe, Duke’s Huntington Beach and Fred’s Mexican Cafe. Nightlife includes a complimentary wine hour, making smores on the fire pit and you can walk to Killarney Pub and Grill as well as the Longboard Restaurant and Pub. 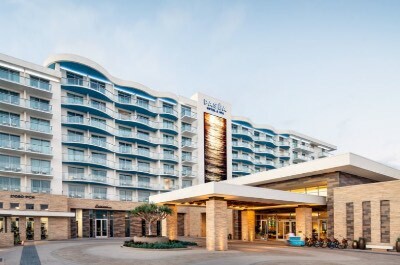 The Pasea Hotel and Spa is a superb upscale hotel in Huntington Beach that is ideal for couples and trendy adults who are seeking onsite resort style amenities as well as a surfing culture atmosphere. Located in the heart of Huntington Beach, the Pasea Hotel and Spa is situated directly on a section of North Huntington Beach only 2-blocks from the Huntington Beach Pier. The Pasea Hotel and Spa has a modern eight story architectural design with 250 rooms and suites which boast a contemporary interior. All rooms and suites have a private balcony with a partial or full ocean view. Rooms are large at 397 square feet with a choice of bedding and floor to ceiling windows. Studios have 415 square feet with a small integrated sitting area and floor to ceiling windows. One-bedroom suites range in size from 740 to 790 square feet with a separate living room that contains a sofa sleeper, wet bar and floor to ceiling windows. One-bedroom Penthouse suites have 1,900 square feet with a separate living room that has a sofa sleeper, a full kitchen, dining room, 1.5-bathrooms, floor to ceiling windows and a double-sided fireplace. The Pasea hotel in Huntington Beach is steps away from North Huntington Beach where you will find complimentary beach equipment and you can arrange for your surfing lessons as well as other watersport activities through the concierge. The Pasea Hotel and Spa is within walking distance to several outstanding attractions such as the Huntington Beach Art Center, Pacific City for shopping as well as the International Surfing Museum and the Huntington Beach Wetlands are 2,5-miles away from the property. The Pasea hotel in Huntington Beach has two freshwater swimming pools with nice sundecks as well as a rooftop terrace, a fitness center that boasts onsite fitness activities and a full service spa. Dining at the hotel includes the Blend Cafe for quick bites and Tanner’s serves all three meals. Offsite dining options are numerous with selections such as Shades Restaurant for seafood, Ola Mexican Kitchen and Sushi on Fire. Nightlife includes watching the sunset from the rooftop Treehouse Bar and you can walk to Tumbleweeds Bar and Grill or Simmzy’s Pub for a cold libation. When you are looking for a value hotel in Huntington Beach that offers perks for families and is close to the beach then you should try the Huntington Beach Inn. Located in the heart of Huntington Beach, the Huntington Beach Inn is situated directly across from North Huntington Beach and is 3-blocks away from the Huntington Beach Pier. The Huntington Beach Inn has a modern Mediterranean three floor architectural style with 50 rooms that have a contemporary decor. Rooms range in size from 350 to 420 square feet with a choice of bedding, a small kitchenette (microwave and refrigerator) and balconies with ocean front views are available in some rooms. The Huntington Beach Inn is just steps away from North Huntington Beach where you will find perfect sand and a plethora of watersport activities. When staying at the Huntington Beach Inn you will be within walking distance to shopping in downtown, the Huntington Beach Art Center and you are 3-miles away from the Shipley Nature Center. The Huntington Beach Inn has a nice rooftop terrace with a hot tub and a fitness center but not offer a freshwater swimming pool or a restaurant onsite. Dining includes a complimentary continental with several restaurants within walking distance Sancho’s Tacos, Sushi on Fire and Duke’s Huntington Beach. Nightlife is abundant with the Longboard Restaurant and Pub, Killarney Pub and Grill as well as a short walk to Huntington Beach Pier where you will find street performers. 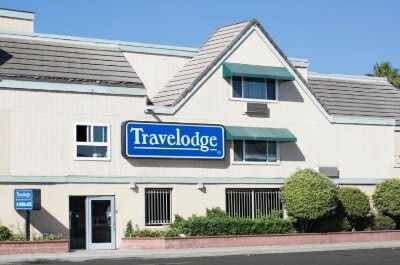 The Travelodge Ocean Front is an ideal value hotel in Huntington Beach that is perfect for on the move travelers who want quick access to many area attractions and short walk to the beach. Located 5-miles from downtown Huntington Beach along the Pacific Coast Highway, the Travelodge Ocean Front is situated within a 5-minute walk to Sunset Beach and is within a short 10-mile drive to Knott’s Berry Farm. The Travelodge Ocean Front has a modern two story architectural design with 50 rooms and suites that boast a contemporary interior. Standard rooms have a choice of bedding and some offer private balconies with ocean views. Suites are larger with a choice of bedding, small sitting area that contains a sofa sleeper and most suites boast a balcony that offers an ocean view. The Travelodge Ocean Front is steps away from Sunset Beach where there is lots of room to lounge and play beach games. You will also find an assortment of watersport activities from surfing to windsurfing to kite boarding. The Travelodge Ocean Front hotel in Huntington Beach offers convenient access to Bolsa Chica State Beach as well as Huntington Beach State Park. The property is within 5-miles to Naples Island, Rancho Los Alamitos, the International Surfing Museum and you are 10-miles to Disneyland Resort. The Travelodge Ocean Front does not offer a freshwater swimming pool, fitness center or restaurant onsite. Dining options include a free continental breakfast as well as several dining choices within a short walk which include Super Mex, the Red Table has American dishes and the Golden Olive prepares Mediterranean cuisine. Nightlife within the area includes Brix Sunset Beach, Mother’s Tavern and J King Neptune’s. When you are seeking a value oriented hotel in Huntington Beach that is ideal for families and provides quick access to the beach and other area attractions then you should stay at the Ocean Surf Inn. 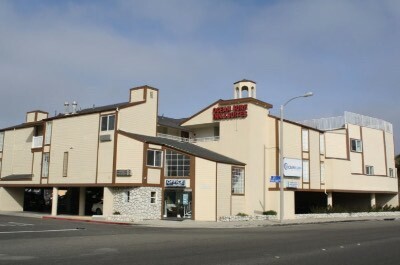 Located in Sunset Beach just 5.5-miles from downtown Huntington Beach along the Pacific Coast Highway, the Ocean Surf Inn and Suites is situated 1-block from Sunset Beach and you are less than 11-miles to Disney Land Resort. The Ocean Surf Inn and Suites has an eclectic modern three floor architectural style with 30 rooms as well as suites which have been recently renovated and sport a contemporary decor. All rooms and suites are furnished with a small kitchenette that includes a microwave and refrigerator. Standard rooms are ample in size with a choice of bedding and views of the highway or courtyard but no balcony. Deluxe and Premier rooms are sized similar with a choice of bedding, a balcony that sports park or ocean views and some are equipped with a Jacuzzi. The Ocean Surf Inn and Suites allows for an easy 5-minute walk to Sunset Beach where you will find plenty of sand to lounge and numerous watersport activities that range from surfing to windsurfing to standup paddleboarding. 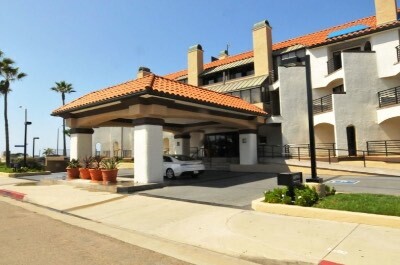 The Ocean Surf Inn and Suites hotel in Huntington Beach is within 2-miles to several natural venues such as Bolsa Chica Ecological Reserve, Seal Beach National Wildlife Refuge where you will find Seal Beach Pier as well as 4-miles from the Shipley Nature Center and you are a 30-minute drive to Knotts Berry Farm. The property has a nice rooftop terrace for relaxing but does not offer a freshwater swimming pool, fitness center or restaurant onsite. Dining options within a short walk to the Ocean Surf Inn and Suites include Roman Cucina for Italian, the Fish Camp prepares seafood and Tsunami Sushi servesw Japanese cuisine. Nightlife can include watching the sunset from the rooftop terrace, a cold beverage at the RIIP Brewery Tasting Room or the Brix Brews. The Best Western Harbour Inn and Suites is a family friendly value hotel in Huntington Beach that offers easy access to the beach and several unexpected amenities onsite. 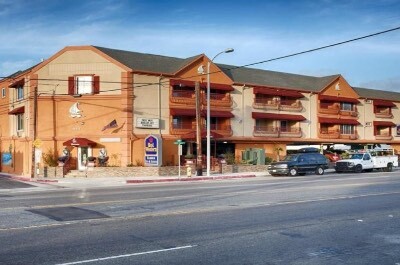 Located up coast from downtown Huntington Beach along the Pacific Coast Highway, the Best Western Harbour Inn and Suites is situated in Sunset Beach overlooking Huntington Harbor and is 2-miles from the Bolsa Chica Ecological Reserve. The Best Western Harbour Inn and Suites has a modern three story architectural design with 25 rooms and suites which feature a tropical interior. All rooms and suites are furnished with a small kitchenette with a microwave and refrigerator. Standard rooms are spacious with a choice of bedding and some rooms are available with a balcony that boasts views of the harbor. One-bedroom suites are larger with a sofa sleeper, a small separate sitting area, a balcony that has harbor views and some rooms are furnished with a Jacuzzi. The Best Western Harbour Inn and Suites has a perfect spot to start your adventures in the area with a short walk to the beach where you will find beach volleyball courts and plenty of sand for relaxing as well as a variety of watersport activities from kayaking to surfing to windsurfing. You are also within 2-miles to Seal Beach and Bolsa Chica State Beach as well as 6-miles to Huntington Beach State Park. The Best Western Harbour Inn and Suites hotel in Huntington Beach is close to several major attractions in the area including 5-miles to downtown Huntington Beach where you will find the Huntington Beach Pier, Naples Island and Pacific City for shopping. The property does not have a freshwater swimming pool but offers two hot tubs and a fitness center onsite. Dining includes a complimentary continental breakfast and there are numerous dining options offsite within walking distance that include Captain Jack’s Restaurant for seafood, Sunset Pizza and Pasta as well as the Harbor House Cafe. Nightlife is abundant within the area with places such as Mother’s Tavern, J King Neptunes and Brix Sunset Beach.